In XSplit Broadcaster, sources such as your gameplay, webcam video, graphic overlays and widgets can be added onto your presentation. Found right below your stage is a list of all of the sources in your active scene. Below it are command buttons to allow you to add, remove and change the order of sources' layering. Sources can be added through the Add Source menu at the bottom of the XSplit Broadcaster window. Select the source and then click the Copy in the source list controls. Note: You can also press Ctrl + C when the source is selected. Go to the scene you want to add the copied source in and then click Paste under the Source List. Note: You can also press Ctrl + V to paste the source. Media, text sources, and widgets in particular will always prompt you to either paste them either as a new source or as a linked source. More information about Linked Sources can be found on the next section. Linked sources are sources which are global across one or more scenes. Useful for example, when you want a text that continues scrolling between two scenes or a fixed lower third on two scenes. A linked source can be created by a copy paste operation. The shortcut to paste as linked source is Ctrl + Alt + V.
Linked sources will always share the same name and have a fixed resolution. The settings in the Color, Layout and Effects tab can be set individually for linked sources. You can choose to apply the same settings in the Color tab, by enabling the “Apply to all linked sources”. To check the list of linked sources of a source, click the "Linked sources" on the bottom right of the source properties. A linked source can be unlinked from the other linked sources by clicking the button in the source properties. A camera source by default is a linked source, but will only have the “Linked sources” list in the source properties if there are other copies of the camera in the presentation. 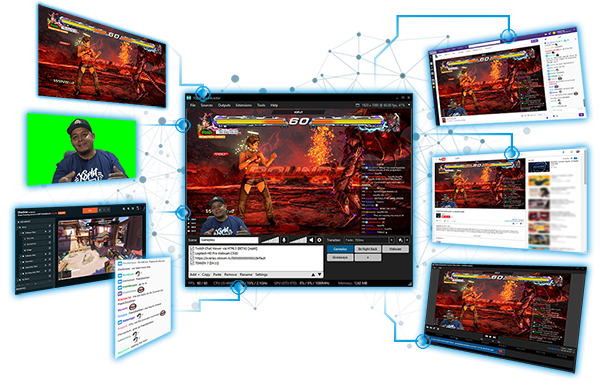 Screen Capture allows you to select any desktop, window or capture custom regions and add them as a source in XSplit Broadcaster. Game Capture directly captures PC games running on OpenGL and DirectX 9-12 (and some DirectX 8 games) and adds them as a source on XSplit Broadcaster. Device capture allows you to add video and audio devices into XSplit Broadcaster. Video devices include webcams and SDI cameras as well as capture cards connected to game consoles, while audio devices can range from microphones to other audio recording devices. Text sources allow you to display text with customizable colors, fonts, animation and more. You can also create or load custom scripts, or select from available script templates. Webpage sources allow you to add URL-based features onto your presentation. You can add images, videos and audio files to your presentation. This is useful for placing your personalized overlay, or adding a running video clip.